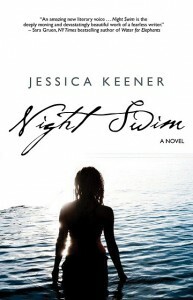 When I started reading Night Swim, by Jessica Keener, I realized I would never want to put it down. And I didn't. I read it really quickly and I really enjoyed it. I totally didn't want it to end. But, alas, as all great reads, it had to. And so it did. The character of Sarah was one that I immediately connected with. Strange to say, since she is a 16-year-old girl living in Boston. You'd think that as a grown woman I'd feel more distant from her, but the way that she is written opens her up to us *the readers* in such a way that we connect pretty quickly. Keener's take on Sarah's youth, and her experiences, is open and often raw. The things this young character goes through leaves us in so many states. She leaves us sympathetic, frustrated, emotional and spent. There were so many times throughout the book that left me wanting to feel happy for Sarah, but at the same time I think I just knew that something else would come that left me sad soon after. Her family life was a bit of a mess. Sarah had siblings, but she often felt quite alone growing up in the home that her parents created. Her father - a unique individual that left me scratching my head a few times. Her mother - ah, her mother. So sad. A young girl wanting a relationship with a normal mother but never quite making it to that point. Sarah is a young Jewish girl in Boston, and struggles with being made fun of for her religion. This aspect of the story definitely touched me, as having grown up in a community where Jews were as common as non-Jews, I couldn't imagine the way she was treated. Not in what was as close to this day and age as possible. My visceral reaction to that sort of talk - the kids that picked on her? - completely raw and real. The way this young girl found the love she yearned for in the arms of a few young men, and where these yearnings left her ... the path of this story is one you'll want to follow straight through to the end. I love the idea of spin-off novels - those are such fun! I've been looking for a new book to read all day! I might just have to try this one out.